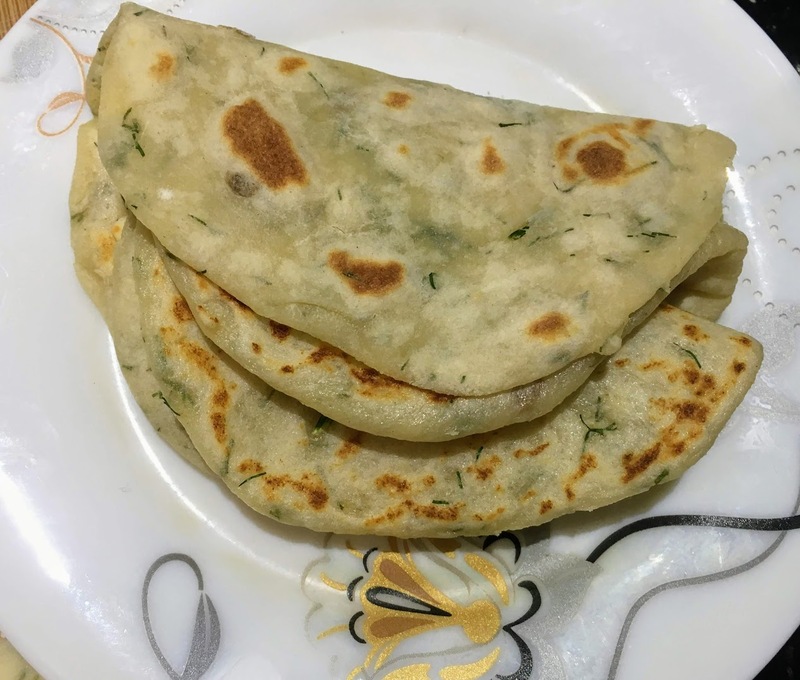 Made of little more than flour and potatoes, this flatbread recipe is one of the easiest and fastest I have yet to prepare. I first came across it on the blog Happy Foods Tube, where I learned that potato flatbread is a staple in Slovakia, often served alongside cabbage and duck. This bread is also popular in Norway and Ireland, where it’s known as lefse and farls, respectively. Some recipes call for the use of a potato ricer. Here, there are no special tools required. I simply boiled a few Idaho potatoes and mashed them with a fork, adding olive oil for moisture and a smoother texture. I also took some creative liberties with the flavor, adding dill and salt. The result is a simple-to-make bread that tastes rich and complex. Note: To prepare the mashed potatoes, boil around two Idaho potatoes (or a handful of smaller potatoes, weighing approximately 240 grams) remove peels, and mash with a fork until smooth. Place mashed potatoes in a large mixing bowl. Add olive oil, stirring with a fork until well-combined. Using your hands, mix in flour until a soft dough forms. Turn onto a well-floured surface and knead until smooth. Optional step: cover and set aside for around 5-10 minutes to allow the gluten to relax, making the dough easier to work with. Roll into a log, and divide dough into 8 equal-sized pieces. Dust each piece with flour and roll into a thin circle, approximately 1/8-inch thick. Place an ungreased cast iron pan over medium-high heat. Cook each flatbread for around 1 minute on each side, until reddish-brown spots begin to form. Serve right away. Store leftovers in tinfoil or an airtight container, and refrigerate.